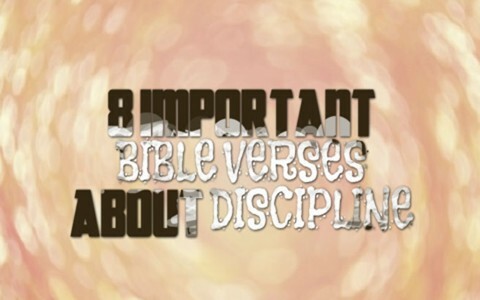 Here are 8 Bible verses that I think are important regarding discipline. In trying to associate the love of God with discipline, the author of Hebrews writes that “It is for discipline that you have to endure. God is treating you as sons. For what son is there whom his father does not discipline? If you are left without discipline, in which all have participated, then you are illegitimate children and not sons” (Heb 12:7-8). Apathy or indifference is worse because then no one cares enough to discipline them and that reveals a lack of natural affection or love which Paul said that the latter days would be like (2 Tim 3:3). Experience is the only teacher that gives you the test first without having studied so there is great wisdom in the love of discipline, which I must confess goes against the grain of our culture however the refusal of discipline or reproof leads to stupid decisions; decisions which can cause us a lot of pain and grief. I would rather be corrected than incorrect any day. At first reading, perhaps you’re thinking that this can’t be one of the most important verses about discipline but think about Who is speaking here; it is Jesus Christ. Jesus is telling the church at Laodicea that He loves them enough to discipline or reprove them. The goal of Jesus’ discipline is so that they would zealously repent. Jesus loves only those whom He disciplines. This tells me that God may discipline us to make us repent of something like a besetting sin we might have in our life. I can find quite a few in mine. How about you? I would love to clear up this Bible verse that seems to trouble so many and has been a point of contention for unbelievers. The “rod” is not the instrument of the discipline; it is the symbol of it. This verse does not condone violence against anyone. It associates the discipline, as represented by the rod, with love, just as Solomon wrote “he who loves him is diligent to discipline” so the specific purpose is always love. Diligent discipline displays love in action. Some of the worst child abuse that I have seen in my life came from parental neglect. When I worked for the state foster care agency a few years ago, I can’t tell you how many horror stories about children that I heard or seen in person. As in this example of this verse, “but a child left to himself brings shame to his mother” (and father), allowing a child to raise themselves (essentially) will cause a lot of shame for the parents. The neglect in this verse is identified as the withholding of the rod of correction. By withholding the rod (discipline) and reproof (consequences) the parents are withholding wisdom. The other extreme of fathers not provoking their children to anger is to not risk any provocation at all and so all disciplining and instruction are either very weak or there’s none at all. One extreme is just as bad as the other. The middle ground is that fathers should bring up (raise) their children in the discipline of the Lord and the instruction of the Lord but in a loving way and in a way that doesn’t provoke them (push them!) into anger. Context in the Bible is always king and so this verse comes among other verses that are warning the reader about the consequences of adultery. The commandment to not commit adultery could be the “commandment” that Solomon says “is a lamp.” I say that because “the commandment” is singular and it is within the context of avoiding adultery (Prov 6:23-35). The “rod” of discipline in this context is the Law of God, as it is given in Exodus 20:14 which says “You shall not commit adultery.” God associates His Law with His Word and so the Word of God, which is the Law of God, reproves us and corrects us and points us to “the way of [eternal] life” because no unrepentant adulterer will enter the kingdom (Rev 21:8). There is so much in the Bible about discipline that I had a difficult time restricting myself to eight verses. I did find that the common theme to discipline is God’s love. You cannot separate love from discipline because discipline is evidence of love. You never discipline those you don’t love but the one’s you never discipline are likely the ones you don’t love or at least love enough. All the scriptures are educating. Thanks very much may God bless you.